I have been a high school music teacher for over 40 years and recently retired from full-time teaching. Since then I have been casually employed as a supply and short-contract teacher, and had the opportunity to see the text books and lesson plans for a wide variety of school subjects. I have been appalled at the way evolutionary concepts (and humanistic thought-patterns) pervade a wide range of subjects and topics. …evolutionary assumptions are constantly promoted, whether relevant to the topic or not. I recently had the opportunity to look closely at some senior biology texts.1 Where the objective scientific information is presented it is generally well done, and I will not comment further. But I noticed that evolutionary assumptions are constantly promoted, whether relevant to the topic or not. For example, a chapter on excretory systems in fish (Biology One, p. 284) begins with the bald statement that ‘Life began in the sea’. It then ‘explains’ that therefore salt-water fish began with salt levels in their blood similar to that of the ocean, having no problem with salt and water balance until they migrated to fresh water, where they evolved more dilute body fluids which were subsequently a problem when they migrated back to the sea. I wouldn’t have thought this series of events would have even been proposed in a scientific text book, but similar unfounded and irrelevant fairy stories occur at the beginning of other chapters. Surely the observed workings of biological systems can be presented without this kind of unnecessary and fanciful introduction, which sits in the minds of the students as a foundation through the chapter. Actually this is straight-out indoctrination, because it is repeated with variations ad nauseum and without qualification or evidence throughout the text. What interested me most was the last two chapters of Biology Two, where, after pounding the evolutionary scenario as fact for the two-year course, the text presents ‘Evidence for Evolution’ and ‘Mechanisms of Evolution’ (two chapters out of twelve—a sixth of the Year 12 course). The chapters ‘interested’ me because I recognized, from the reading I had done, that the ‘evidence’ presented did not support evolution as the text-book had portrayed it in its chapter introductions. If this ‘evidence’ is the best evolutionists can do, they have no right teaching evolution as fact. I felt very concerned for the students because they should have been educated about the problems, the counter evidence and alternative arguments, especially since these concepts affect their world view and self-image. The most glaring problem to anyone willing to think about it is the way the texts use a vague definition of evolution to justify the validity of the ‘evidence’ and ‘mechanisms’. The book says that ‘Evolution is a process of change’. That’s it! Although the same paragraph explains that the theory of evolution proposes that all living things have a common ancestor, it does not expand the definition. From there, any observed change represents evolution.3 What poor logic! The problem is that the small changes are going in the wrong direction. The small changes observed cannot cross the divide between phyla and other higher-order divisions, which the theory claims, but this is studiously ignored. Consequently, the term ‘evolution’ is applied so broadly that no one can argue against it. This is most obvious in the ‘mechanisms’ chapter, where an almost laughable example involves the population of Pingelap Island. Here a chief with a genetic disease has, through his many children, ‘had an important evolutionary effect’ on the population through genetic drift (emphasis mine). I suspect eugenicists would cringe at the thought. Yes, the genetic disease is real, as is the effect on his children. But this is not the sort of change that will turn a fish into a falcon over millions of years. That needs new genetic information in order to specify new biological components. Similarly, the text claims that ‘the Australian sheep blowfly has evolved chemical resistance to … dieldrin’. But then the text itself points out that the resistant strain already existed in the population before the introduction of dieldrin as an insecticide. 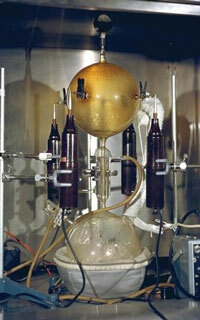 The argument is that, because the resistant strain became dominant for a while (‘change’! ), therefore ‘evolution’ has occurred. But there is no new genetic information. The text does explain that selection produces no new genetic material, but then it promotes several examples of selection as examples of evolution, such as the hoary old peppered moth, and antibiotic resistance. The confusion arises from the poor definition of evolution—that ‘change = evolution’. Such appalling illogic from a science text! But as indoctrination it is highly dangerous because it is so subtle. The ‘Evidence for Evolution’ chapter presents nothing that cannot be easily demolished by someone with a little knowledge and a reasonable eye for indoctrination tricks. The first is a picture of your typical ‘ape-man’ plodding across a barren landscape with a volcano in the background. This evocation of a constantly-presented evolutionary scenario is evidence for nothing—you might as well have a picture of Jabba the Hut, trekking across a Star Wars landscape. Both are imaginary! 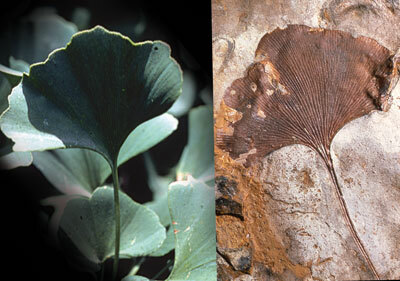 Ginkgo biloba is an example of stasis, a major problem for evolution. (living, left; fossil, right). The ‘formation of fossils’ section gives the uniformitarian story, of course. No alternative explanation is considered, so it again represents indoctrination rather than education. Concepts like indicator fossils, comparative anatomy, phylogenetic trees, and biogeography are given as supportive evidence for evolution, but the circularity of such arguments is ignored. Our future scientists need to be trained to think critically and question, so why is this kind of empty presentation given as an example of scientific process? Why is such complete nonsense in any text today? Because the writers aren’t keeping up-to-date? Or maybe these things are just too effective in the indoctrination process to let them go? The section on ‘being human’ demonstrates how school texts parrot other text books, but as has been said, the evolutionary sequences are neat and clear only in text books. Take, for example, the now discredited ‘horse series’. In the real world, ideas about evolution are very tentative and subject to constant debate, especially over the issue of human origins. The gene tree presented for humans is exactly what would be expected from the biblical ‘table of nations’ in Genesis. Why doesn’t a school text on the subject admit this? Is it because students are not to question the standard line? Lastly, the text makes even fewer scientific statements to justify its ‘evidence for evolution’ by discussing ‘cultural evolution’. The statement that during the last 10,000 years cultural and social structures have become ‘progressively more complex’ not only relies on little evidence but contradicts the facts. The earliest civilizations produced highly sophisticated and complex cultures early (building amazing structures, some still inexplicable), followed by decline, even to ‘cave man’ standard (seen in many cultures even in modern times), followed again by technological advance in modern times under Christian principles. The evidence is better explained by the biblical account of dispersion after the Flood (and subsequent Ice Age—see What about the Ice Age?). I was aware that these sorts of problems existed in school text books, since they had already been discussed in articles such as What biology textbooks never told you about evolution. But I found it quite disturbing when I encountered the problem in my own teaching program. 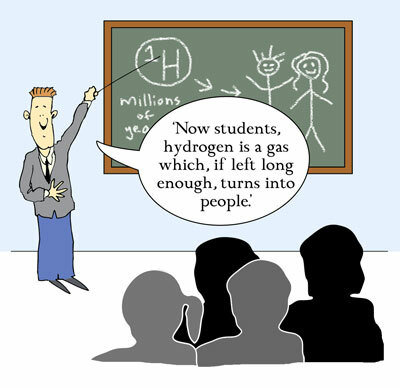 In my view, the way these high school texts present the material is nothing short of indoctrination, and I am personally appalled that it continues in the classroom with the approval of most teachers, especially science teachers. Probably most are ignorant of both the weaknesses in the arguments and evidence presented, and the implications of the evolutionary view for the developing world-view of the students they teach. In my view, it is incumbent upon the teaching staff to routinely explore with the students (and not only students of biology) the short-comings of the evolutionary paradigm as presented in their text books. In fact, the text books should be used as ‘exhibits’ for the classroom, and students encouraged to identify those places where the text is presenting personal beliefs rather than scientific observations. How do we do this? On an individual level we can be informed of the problems and stimulate questions and investigation in our classrooms. On a local level, I have handed a detailed review of the text books concerned to the head of science in a local school. However, I have received no response to date. More broadly still, perhaps the matter should be raised as input into the Federal Government’s proposals for a national curriculum.